Traditionally is named “fruit of shining light” for its translucent golden colour, smooth aspect and lovely shape. Being a full owner of a palm grove certified Bio, “Horchani Dattes” is the pioneer in this field. For eight years, “Horchani Dattes” has used organic agriculture based on a selection of the best date palms within the varieties of “Deglet Nour” certified by ECOCERT, a renowned French certifying organisation. The production is labelled AB (Agriculture Bio). At the moment, the volume of organic date export is 440 tons, but in the face of rising demand from our foreign customers, “Horchani Dattes” is planning to double, and even treble it’s production of organic dates to reach 1000 tons for the next five years. “Horchani Dattes” is always in touch with its customers to better give them and offer a perfect product. “Oasis” is an Egyptian word which had been used by the Greeks, and owes Herodotus (an ancient Greek Historian) the first description of the largest and the most famous Oasis : Egypt. 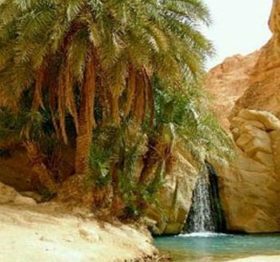 The obvious contrast offered by the oasis, with its water and luxuriant vegetation on the one hand and the arid area surrounding it on the other hand, has attracted people’s attention. This explains why Greek and Arab geographers attached importance to these relatively confined spaces. “The miracle of water” is the expression which comes again and again in most of the descriptions. The Djerid in southern Tunisia with its many oases over the breath-taking rugged landscape, is one of the oldest inhabited regions in the low Sahara. A field of beautiful palm groves which owes the reputation of their health to the green oasis, spread out along Chott-el-Jerid. Their existence is linked to the spread of springs whose water allowed the expansion of irrigation in Tozeur, Nefta, Hammamet and the production of high-quality dates. 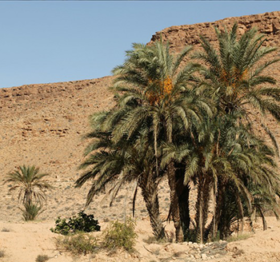 As the market economy came into the modern palm groves of the south of Tunisia, only some varieties of dates – those which are most sold because they are the best – are grown, the less profitable varieties have been abandoned. Furthermore, the charm of the oasis and the exotic nature of the Sahara have given birth to a new Saharan tourism taking over from coastal tourism during the sweet winter holidays and the fresh spring days. The town of Tozeur, with its fascinating beauty has become the tourist’s favourite destination since it has made a name for itself at the tourist level through its purely tourist activities rather than its classical and conventional hotels. An attractive formula matching sound and lights is the new tourist achievement which aims at arousing tourist’s curiosity and initiate him about the broad lines of the history of our country. Small centres devoted to sport and entertainment grew up the shade of the palm groves inviting tourists to join our various activities (sand scooters, hot air balloons and helicopter trips). The event expected in the oasis is the opening of the “Planet Oasis” soon. Getting away from African and Asian forests, the date palm took up residence in the desert whose sun, heat and dry air ripen its fruit. It kept an immoderate taste for water, satisfied by the underground expansions of the oasis. The date palm sets it’s foliage swaging in a stately way up to 20 meters from the ground and provides the scenery with a particular style. Its shade is a shelter against the burning heat of the desert, and its heavy date clusters represent the richness of the Oasis. Close to ground levee, the date palm has no branches. Its trunk grows thanks to the incessant activity of a bud hidden in the heart of the palms. There are male and female date palms, but one cannot distinguish them before they flower. 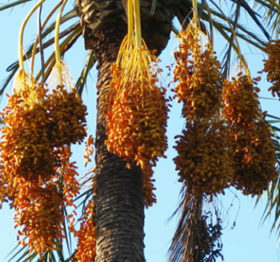 Only one date palm may pollinate a hundred of females, hence their predominance in the palm grove. 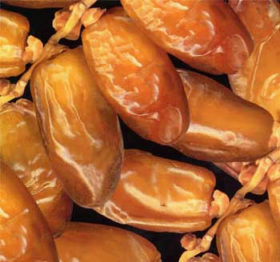 Although, it is enough to plant the pit, or stone of a date to obtain the growth of a date palm, the Phoenician planters do not trust to chance the seedling and made a point of planting female date palms bearing a selection of dates, while resorting to a sort of cutting which allow the commercial plantations to multiply. For many years, we have been cloning date palms in laboratory into thousands of specimen starting from a very young bud taken from a tree. The palm tree is a mythical tree, a symbol of amnesty and prosperity, highly regarded by the big Mediterranean religions born on the land of the palms.